My name is Hans Fjällemark. I am a freelancing developer & designer from Sweden. My name is Hans Fjällemark, a husband of one and father of two, living in Gothenburg, Sweden. I am a developer and designer with a passion for crafting beautiful user interfaces and writing clean code. I started building and designing web sites at an age of 8 and have since then worked my way through various roles ranging from self-employed developer to VP Engineering. 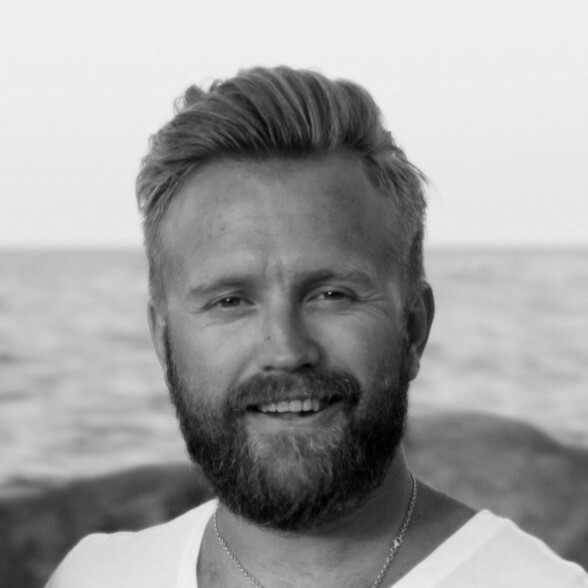 Co-founded a new consultancy business with my long-time friend Niklas Ranås specializing in application development primarily for web but also native mobile development using cross-platform tools such as React Native. We emphasize on user experience, cross-platform/cross-device front end development and REST/GraphQL backends hosted by PaaS services such as AWS, Azure or Heroku. As VP of Product Engineering at Cignium Technologies I was responsible for the two primary products that powered an end-to-end customer acquisition business with over 700 licensed sales agents across the United States. I grew and managed a team of developers distributed over three continents as well as launching and managing a new branch office in Gothenburg, Sweden. After leaving my employment at Hogia PA-system I worked as a consultant specializing on UI development; primarily web but also Silverlight and WPF. I was normally brought in to bootstrap and provide an initial design and architecture that other team members could maintain and evolve. I regularly trained employees in new web technologies through workshops and presentations. During my employment with Hogia PA-system I was primarily doing web development for Hogia's web user interfaces. I designed and implemented UI frameworks using ASP.NET Web Forms and ASP.NET MVC that were used by multiple Hogia companies to build their next generation web applications. As the specialist and primary responsible developer for all web development efforts within the company I also trained other team members on best practices and technologies as legacy Windows applications were transitioned over to the web. Our first project at Anylabs was a web application for drone imagery analytics. Data and imagery recorded by drones is uploaded and made available to constructors, planners and other stake holders in a simple and intuitive web interface where construction sites can be visually analyzed, measured and compared over time as projects progresses. With freedom of choice on tech stack and hosting infrastructure we went with Elm for a robust and performant UI, backend was powered by a GraphQL api using PostGraphile and PostgreSQL. Image processing heavy lifting was done with a worker written in Go. Hosting platform was a no-brainer; Heroku and its delightful Heroku Flow allowed us to focus 100% on building the app without spending time on configuring CI servers and setting up staging/production environments. The customer was able to test new features within seconds after pushing commits and the instant feedback loop enabled quick iterations that allowed us to build the right features from start even though the customer did not have all the requirements nailed down. SAPO (Sales, Applications, Policies, Offers) was a back-office application we built for the case management team who supported the sales agents in converting sales into policies. As we replaced their existing workflow using spreadsheets and manual data entry, we decided to work closely with the case management team to learn their process and how to automate and make trivial, repetitive tasks more efficient. 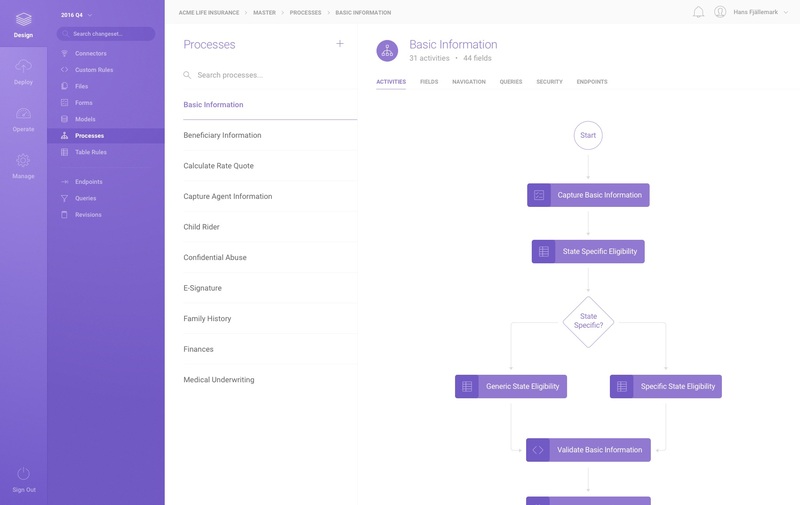 The end-result was a performant user interface heavily optimized for usability and efficiency as well as a backend that integrated and automated importing and exporting data from and to insurance carriers. As the deadline was very short we decided to use technology and patterns we knew well; backend in .NET Core, front-end in React and hosting using Azure PaaS services. Heavily leveraging Hypermedia for access control and dynamic JSON forms to control similar views and forms solely from the backend and avoid repetitive front-end code. Lifecycle Management was a low-code development platform that me and my former CEO envisioned for enabling business users to build and configure enterprise apps and workflows. This platform was in particular geared towards orchestrating complex sales and fullfilment workflows for the insurance industry. As VP of Product Engineering I was responsible for the overall design and architecture as well as building and leading a team of developers distributed over the United States, Europe and South America. We started out with a small team and I was heavily involved in the early design and architecture work. Most of the team were full-stack developers and collectively shared the responsibilities involved with developing a product. While some focused more on the DevOps side, managing the continouous integration and delivery lifecycle using Bitbucket and Bamboo, others were more deep in the front-end side, building a React SPA application. Everybody worked on the backend, where the bulk of the work was, which consisted mainly of a REST API powered by ASP.NET MVC and Entity Framework. We heavily leveraged Azure PaaS services such as Azure Web Apps, Azure SQL, Azure Service Bus and Azure Storage to minimize infrastructure work such as managing VM:s and configuring networking. App prototype designed in Sketch by me. This is by no means a full list of skills but should give an idea my past experience and what technologies I am curious about. If you want a more comprehensive list, or if you have questions about specific technologies and frameworks, let's talk! You can always reach me on Twitter. If you have specific questions or work inquiries, feel free to reach out to me using the contact form below.